What do you think of when you hear the brand Bon Marche? I used to think their fashion was aimed at the older lady, but did you know this value fashion store is the UK's leading affordable fashion retailer? They are proud of their clothes which are designed for real women, with a flattering fit. 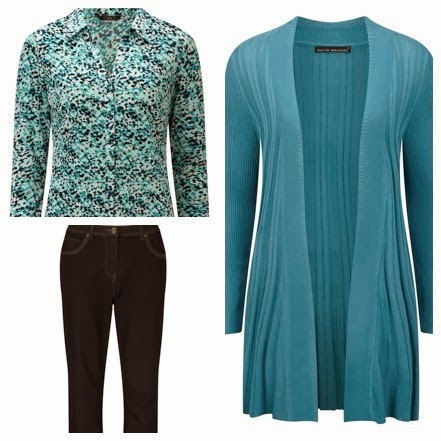 So I chose this edge to edge waterfall style cardigan to review. 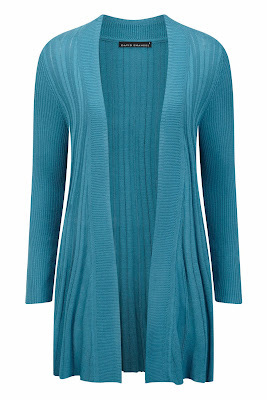 This cardigan is part of the range designed by David Emanuel the well know fashion designer. This lovely cardigan is very versatile, made with a soft material it can be worn to work or casual with jeans, it can also be dressed up to take you through to the evening. What I liked about this cardigan is that it has soft pleats around your hips, great for those ladies who like to hide this area. Available in a range of colours this is one of their bestsellers on the Bon Marche website. There was only one problem, I did, however find that this cardigan was a bit too big for me. The problem is although most clothes can be ordered in normal sizes e.g. 12, 14 etc this item could only be ordered in Small, Medium and Large, and I'm in-between sizes. Not Bon Marche's problem but my problem lol! How would I style this? I would pair with some bootleg or skinny jeans, black boots and a statement shirt. One idea is below. Bon Marche is good for occasion wear too. This flippy hem dress below is only £18 in the sale. I have styled it simply with a clutch bag at £6 in the sale and suede shoes at £20, a whole outfit for £44 - bargain! What do you think of the prices? Have you ever shopped in Bon Marche? Bon Marche good review I agree their sizes are a little on the large size so you always need to buy one size smaller than you are.I like the dress too. I love the colour of that cardigan! Yes it's a great colour, I would say it's teal, and they do this in at least another 6 colours if not more. Love the cardigan colour - i'm obsessed with blue at the moment. It's an amazing colour, and goes well with blue jeans.